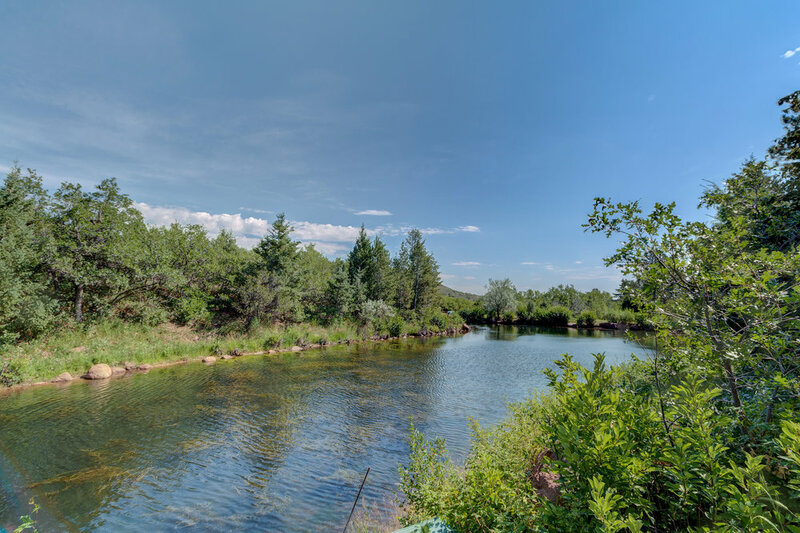 Tucked away on 5.6 secluded acres that borders Pike National Forest, this custom Spanish Hacienda offers a one-of-a-kind resort setting with an amazing one-acre trout pond and a year round creek. 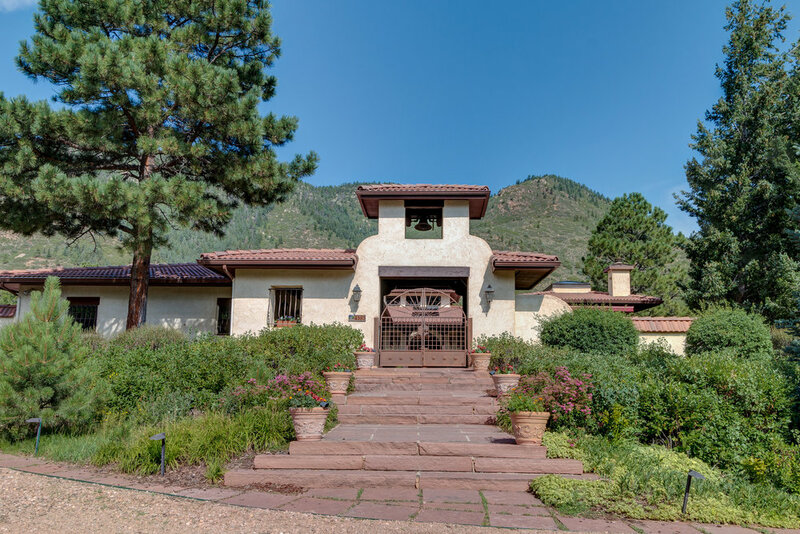 Custom built and completed in 2001, the home offers spacious main level living, amazing details, oversized windows that frame the magnificent view and an approximately 5,000 square feet of outdoor living space. In addition to the fabulous main house, there is a charming cottage/guest house with an additional 463 square feet and a 12-car detached garage/barn. A handsome gated entrance opens to meandering gravel driveway that leads to home. 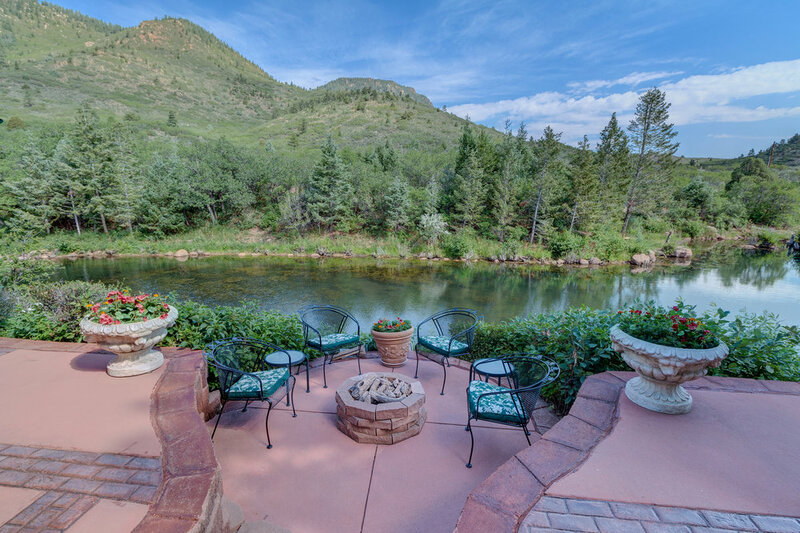 The home boasts premier outdoor living areas that include an impressive front courtyard, a side patio and an expansive lower level patio that overlooks the pond. Arched iron doors open to the inviting front courtyard that features an authentic bell tower and a stately fountain. In the center of the courtyard there are gravel walkways that travel around the lovely flower beds. Around the perimeter on two sides of the courtyard there is a covered patio with rustic cedar columns, “brick” stamped concrete flooring and a lattia ceiling with wood beams. There is also a “brick” patio off the sun room with a retractable awning…perfect for entertaining! As a finishing touch, the patios around the courtyard are adorned with 14 iron lanterns for added ambiance. 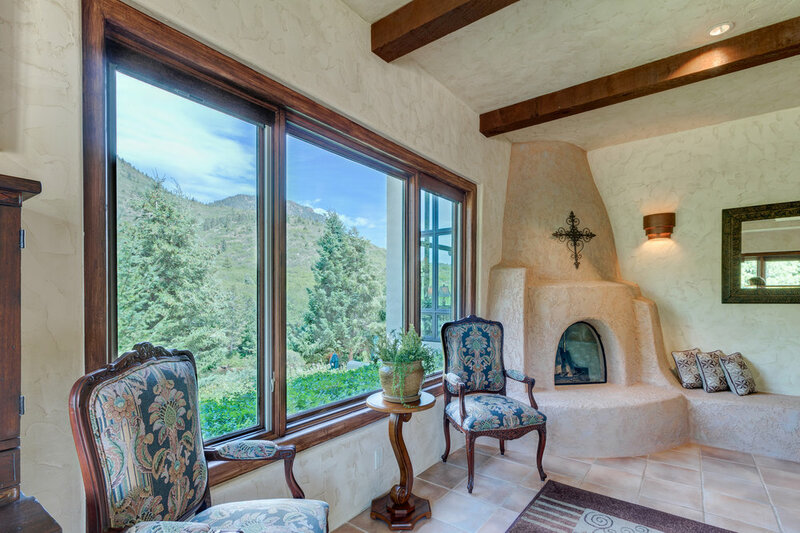 The sunroom also opens to a spacious side patio with serene views of the mountains and pond. The expansive lower level patio offers numerous sitting/dining areas to include a cozy sitting area around a gas fire pit. This patio is concrete with stamped “brick” accents. It also has anchored holders in the cement for your outdoor umbrellas….how’s that for attention to detail! Outside and next to the garage, there is workshop with private entrance. In the same area there is a privacy wall. Behind the wall, there is a greenhouse and a backup generator with automatic switch-over. Also on the property there are two 1,000 gallon propane tanks. 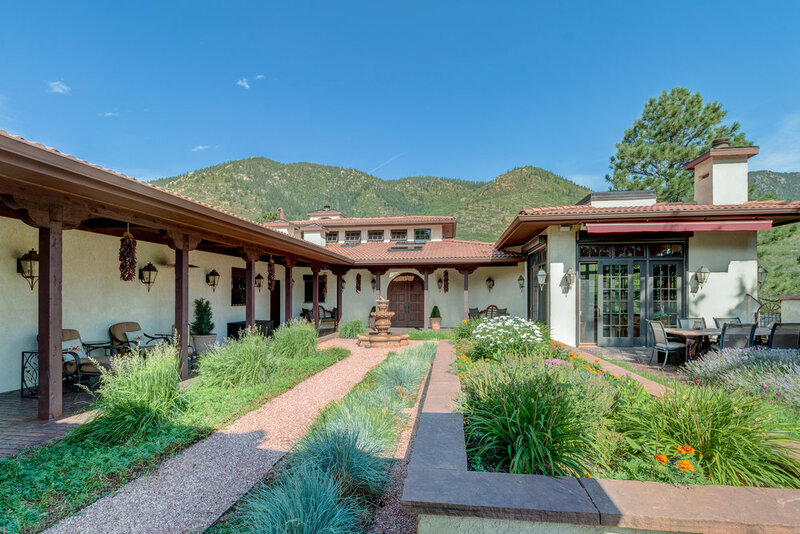 The home was built using energy efficient green block concrete/foam construction which also resulted in thicker, more substantial walls that add to the home’s hacienda ambiance. Impressive, arched wooden front doors open to a vestibule with coat closet. 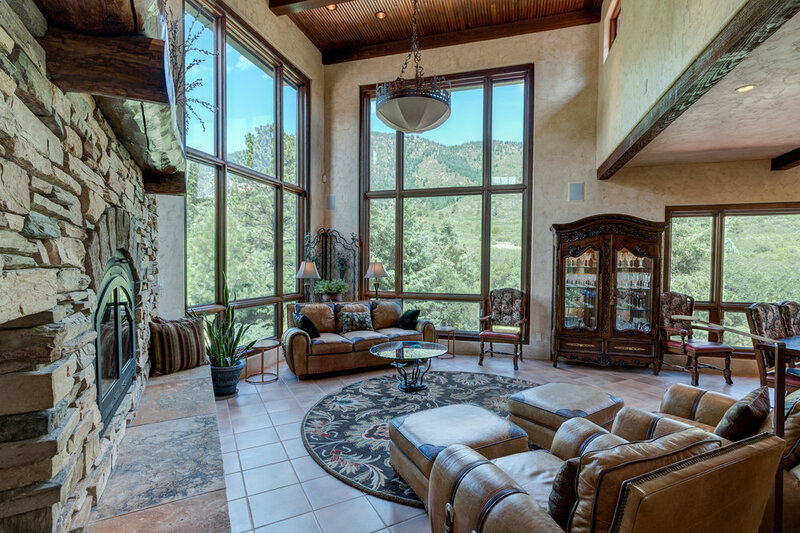 In turn, the vestibule has door with glass panes that opens to the magnificent great room. 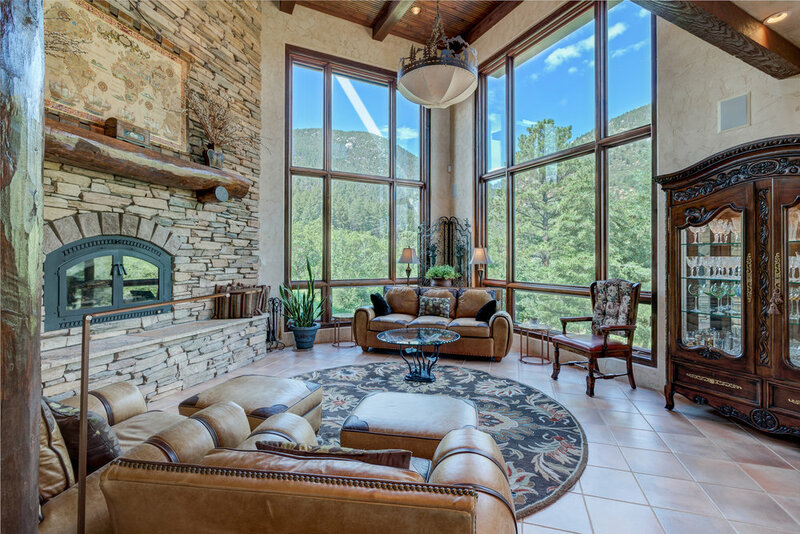 The crown jewel of the home is the great room which boasts a floor-to-ceiling wood-burning stone fireplace and an 18’ wood lattia ceiling with cedar beams and leather & iron chandelier. Framing the view of the pond, the national forest and the foothills, the room has floor-to-ceiling windows that are amazing. The great room opens to the dining room where two massive log columns announce the room’s entrance. The dining room has a built-in buffet, a fallow deer antler chandelier and a beamed ceiling. The beamed ceiling continues over the staircase to the lower level and to the kitchen. Next, there is the gourmet kitchen. The kitchen’s custom cherry cabinetry by Wood Mode feature two built-in buffets and a workstation with storage and file drawers. Additional amenities include a center island, pantry and slab granite countertops. The kitchen appliances include a Thermador 5-burner gas cooktop with embossed custom flue & warming shelves, a Sub Zero refrigerator/freezer, Sharp microwave, 2 Bosch dishwashers and Thermador double ovens. Next to the kitchen, a pocket door with 15 glass panes leads to the inviting sun room/family room. 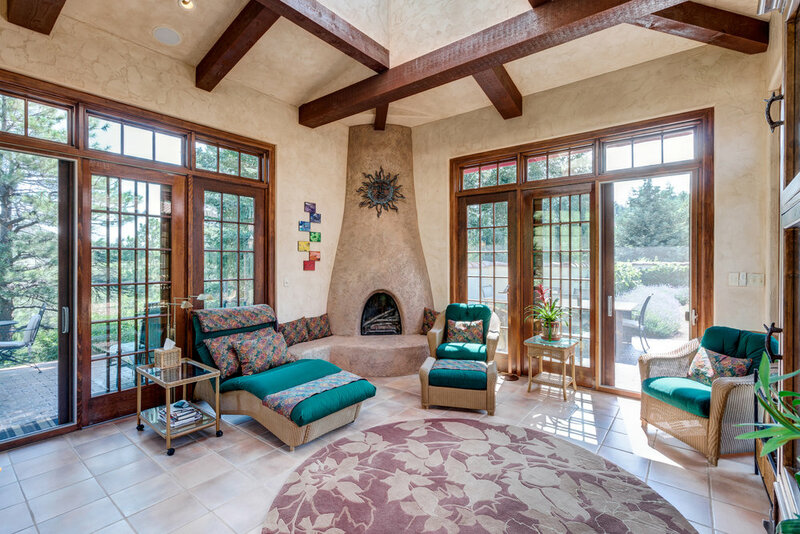 This stunning room has a kiva wood burning fireplace and a beamed 12’ ceiling with a 5’ X 8’ center skylight that raises this portion of the ceiling to 14’. (The skylight has rope lighting as an added touch! 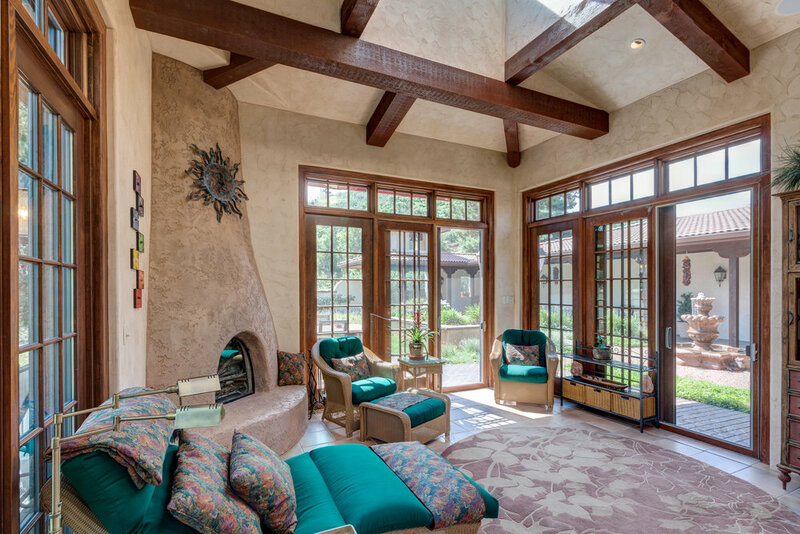 The sunroom also has a built-in DCS gas barbeque grill with rotisserie and stone surround and three of French sliding doors that open to outside living areas. 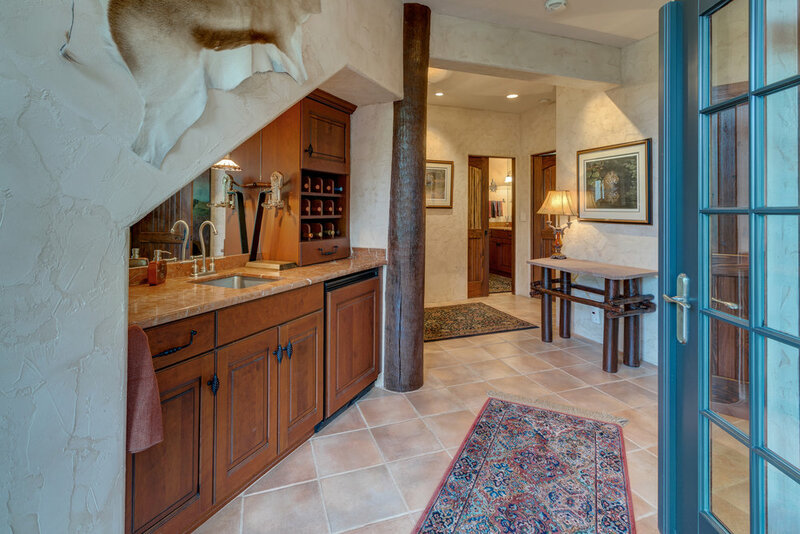 Off the great room, a hallway leads to the powder room, the laundry room, the heated garage and the master bedroom. The well-designed hallway has beamed ceiling with skylight and a convenient seating niche next to the garage. The powder room features a solid marble pedestal sink and skylight. The ample laundry room has a sink and white cabinetry. 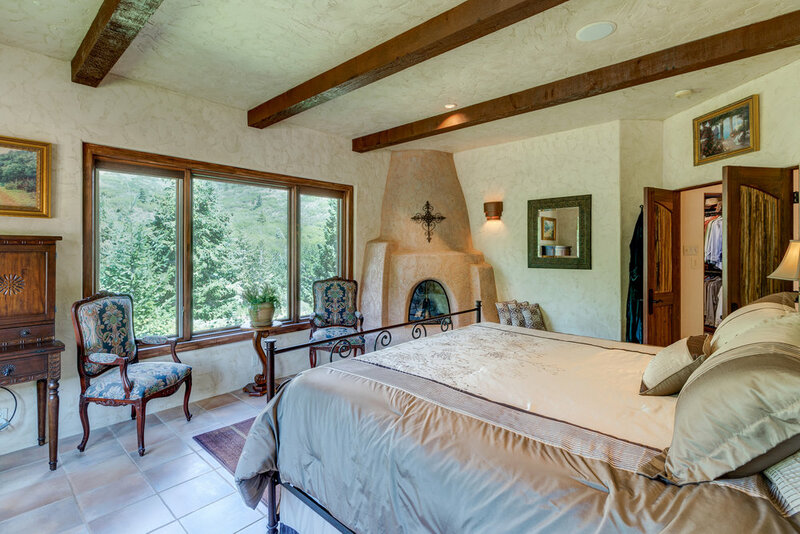 Double doors lead to the master suite which offers a kiva fireplace with gas logs, window bench with cedar lined storage below and a wood beamed ceiling. The bed wall is perfectly placed directly across from a big picture window where the breathtaking views await. The master bath has a claw-foot slipper soaking tub, dual vanities with slab marble countertops, water closet with bidet and a European wall hung toilet and a big marble shower with two showerheads, and bench and glass block enclosure. The bathroom also has a big sliding glass door that opens to a flagstone pathway. The master closet, which measures 12’ x 13,’ has a center isle with storage, cedar lined walls, skylight and an operable window for fresh air. A staircase with wood steps and log railings descends to the lower level where a landing with glass French doors awaits. Carefully placed, the French doors open to the lower level patio and frame the cozy sitting area with fire pit with the pond beyond. To the right of the landing, another set of French doors lead to a big bedroom with custom cabinetry that houses a built-in murphy bed with integrated wardrobes on each side. This room also has built-in bookshelves, custom copper wall sconces and a second set of French doors that provide easier access to the adjacent full bath. To the left, a tiled hallway leads to the office with glass French doors (currently used for a hot tub), a guestroom (currently used as a theater room) and a deluxe marble bathroom with steam shower. Across the hall from the office, there is a wet bar with slab marble countertop and refrigerator. Lastly, there is a spacious storage room with shelving. Off the storage room there is a utility room with additional storage space. Nestled in the trees next to the creek, the guesthouse has Hogan styled architecture and features a bedroom/sitting area, full kitchen, bathroom with shower and a private deck. Loaded with character, the cottage has Saltillo tile floors, wood wainscoting and a wood ceiling with beams. The cottage also enjoys a two-tiered private deck that overlooks the creek. Utilities for the cottage are electric base board heat. Used as a vacation rental, the cottage generates $30K to $36K of gross revenue a year. Lastly, there is a huge 40’ X 65’ shop/garage. 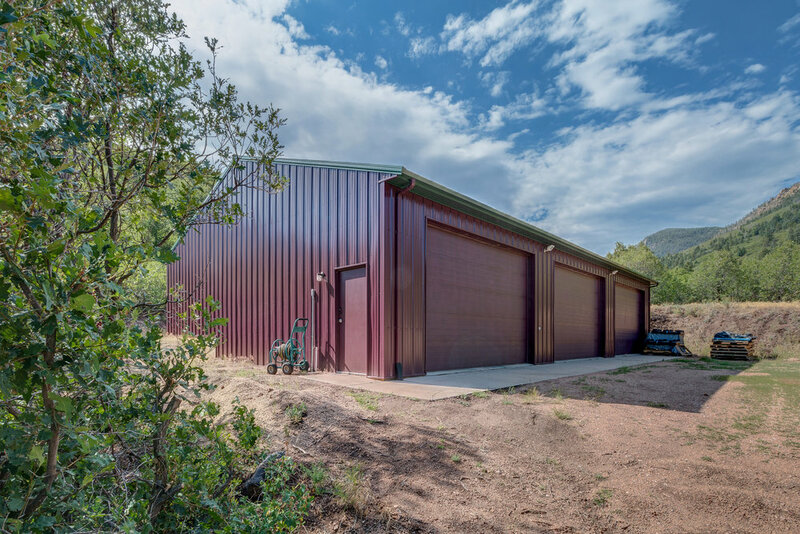 Double deep with a 12’ ceiling, the garage has three sets of double garage doors and can house up to 12 cars.